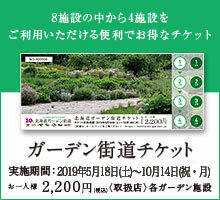 We received the following application for '2019 Garden Treasure Hunt' from September 1st to October 1 4th 8 4th. This year, the number of visitors decreased sharply due to the earthquake that occurred on September 6th, but we appreciate everyone who visited us despite such time. On October 2 7th, we got a honorable election, the following people won. We delivered the prize on October 2 7th.